At the 2300 Arena in South Philly Saturday night Hard Hitting Promotions put on a six bout card with the main event having Philly’s “Hammerin” Hank Lundy defeating former WBO Super Lightweight Champion DeMarcus “Chop Chop” Corley. In the Main Event southpaw Lightweight “Hammerin” Hank Lundy, 29-6-1 (14), defeated former WBO Super Lightweight Champion southpaw DeMarcus “Chop Chop” Corley, 50-29-1 (28), of Washington, DC., over 8 rounds. “Chop Chop” made his entrance on a “hoverboard” with flags in each hand to the delight of the crowd. In the opening round Lundy flipped Corley without a warning from referee Shawn Clark. Lundy out landed Corley though it was Corley who ended the round with a good combination to the head of Lundy. In the second round Corley landed a solid right hook to the head of Lundy. Lundy was having a problem landing as Corley showed his defensive skills. Then a Corley left to the head of Lundy had the crowd cheering. Corley evened the score. In the third round Corley landed a combination with Lundy missing wildly in return. Even though missing half his punches, Lundy still out landed Corley, who did more on defense. Lundy turned to orthodox in the round. In the fourth round Corley landed a solid lead left to the mid-section of Lundy. A lead left from Corley rocked Lundy taking one on the chin. As it seemed both boxers collided a right from Lundy to the body of Corley caused a flash knockdown. In the fifth round Lundy landed a 3-punch combination backing Corley up several steps. Lundy switched back to southpaw still out working Corley. In the sixth round Corley landed a 3-punch combination to the head of Lundy. Lundy missed several punches looking to end it to no avail. In the seventh round a lead left by Corley to the chin of Lundy backed him to the ropes. Lundy got a warning from referee Shawn Clark for a low blow. Again missing more than landing Lundy still did enough to take the round of an aging Corley. In the eighth and final round Corley landed several combinations but Lundy came back rocking him with a left to the head at the bell. Judge Poturaj 79-73 and judges Rubenstein and Page 79-72 as did this writer. 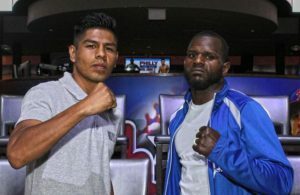 In the co-feature Super Middleweight southpaw Derrick “Take it to the Bank” Webster, 25-1 (13), of Glassboro, NJ, won a lopsided decision over Francisco “El Volcan” Cordero, 38-10 (29), of Barranquilla, Colombia. Judge Kenny had it 79-73 with Poturaj and Rubenstein having it 80-72 as did this writer. In the opening round the much taller Webster had an easy time of it but Cordero either smiled or waved him in for more. In the second round taking many jabs Cordero landed several overhand rights backing Webster up. Cordero landed a right and left to the head of a smiling Webster. Webster went back to his usual counter punching style taking the round. In the third round Cordero kept coming forward showing little respect to Webster’s punching power. Webster continued giving Cordero a boxing lesson until a Cordero punch went a little south making referee Benjy Esteves, Jr. gave a warning to Cordero and Webster getting several minutes rest. 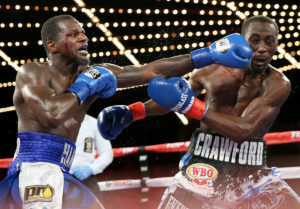 In the fourth round both boxers were pounding their chests when Cordero drove Webster back several steps with a pair of wild punches to the head. Webster could land his jab with his eyes closed the way he is painting Cordero’s face. In the fifth round Cordero landed several wild left hooks backing Webster up. Webster came back with his jab while Corder landed a right and left to his head. Webster landed a hard straight left to the chin of Webster. In the last 10 seconds Cordero started chasing Webster who was pack pedaling. In the sixth round Webster landed a rare left uppercut which seemed to be the punch to hurt Cordero. Webster decided to stop moving around the ring pop shoting Cordero in the middle of the ring until a Cordero right to the chin got Webster back on his bicycle. The fans started cheering for the underdog Cordero by the end of the round. In the seventh round Webster continued Webster had press row wondering how Cordero was still upright. In the eighth it was all Webster but it was Cordero with his hands held high and the crowd cheering him for chasing Webster in spite of the obvious size difference. For the vacant WBC International Super Featherweight title Nydia “DaPhenopenal” Feliciano, 9-10-3 (0), of the Bronx, NY, lost a lopsided decision to Alicia “The Baum” Baumgardner, 5-0 (4), of Fremont, OH, over 8 rounds for the vacant WBC International Super Featherweight title. In Feliciano’s corner was Brian Cohen who is well known for his stable of female boxers. Judge Page and Poturaj had it 79-73 and Kenny 78-72. This writer had it 79-73. In the opening round Baumgardner came out throwing bombs to the head of Feliciano. Halfway through the round Feliciano got Baumgardner’s attention with a right to the head. In the second round Baumgardner landed half a dozen unanswered punches without return in the middle of the round. Feliciano kept coming forward. Baumgardner’s percentage of landing punches is near perfect. In the third round Feliciano made it close finishing strong after taking her share of punches coming forward in a peek-a-boo defense. In the fourth round Baumgardner landed good uppercuts to the chin of Feliciano finally rocking her with a good right to the chin that got the crowd’s reaction. In the fifth round Baumgardner worked the body trying to bring the defense of Feliciano down. Baumgardner kept up the attack. In the sixth round Feliciano landed a nice combination to the head of Baumgardner. Baumgardner has gone into the fifth round for the first time and slowed down in the round. Close round with Feliciano possibly pulling it out. In the seventh round this round was similar to the first 5 rounds with Baumgardner landing a solid right uppercut to the chin of Feliciano just prior to the bell. In the eighth and final round Baumgardner was using the ring well with Baumgardner never giving up coming forward. Lightweight prospect southpaw Jeremy “King” Cuevas, 7-0 (5), of Philly, won a workman like stoppage scoring several knockdowns as southpaw “Mighty” Mike Fowler, 6-13 (2), of Milwaukee, WI, couldn’t come out for the fifth round. In the opening round both southpaw’s mixed it up well. With about 10 seconds to go in the round a left from Cuevas to the head of Fowler dropped him for referee Clark’s 8 count as the bell sounded. In the second round it didn’t take long before another chopping left from Cuevas to the head dropped Fowler. Cuevas followed up with a good right uppercut to the chin of Fowler who was fighting back. Good round for Cuevas but Fowler is better than his record show’s. In the third round Cuevas started to go to the body of Fowler who held his own though falling short once again. In the fourth round Cuevas landed a jab followed by a straight left to the chin of Fowler. Cuevas landed the best punch of the round a lead left to the head of Fowler just prior to the bell. Fowler couldn’t come out for the fifth round. Assisting Tony Bersani was long time Philly trainer Charles “Cornbread” Ramey. Heavyweight southpaw Hasim “Gold Blooded” Rahman, Jr., 4-0 (3) of Baltimore, MD, took a majority decision over Rony “Big Country” Hale, 3-11 (3). In the opening round southpaw Rahman was pin pointing his punches well. Hale got in one wild right to the side of Rahman’s left side of the head. Near the end of the round Hale got in a good right to the head that got Rahman’s attention. Rahman landed too many punches in taking the round. In the second round Rahman turned orthodox after taking a wild right to the chin. He had been landing shots to the big mid-section of Hale who turned southpaw and back to orthodox. It was a very close round. Both looked winded. In the third round Hale had Rahman against the ropes landing half a dozen punches without return before tying up Hale. Halfway through the round Hale landed a lead right to the chin putting Rahman against the ropes. Both looked exhausted with Hale coming back to take the round. In the fourth and final round with both tired, especially Hale, there wasn’t much action as Rahman seemed to pull it out. Judge Page had it 38-38, Judge Rubenstein 39-37 and Kenny 40-36 for Rahman. This writer had it 39-37 for Rahman. In the opening bout Middleweight “Dangerous” Dillon Kasprzak, 0-1 (0), of Philly, lost a split decision to southpaw Michael “The Hammer” Crain, 1-1 (0), of Smyrna, DE, in a spirited 4 rounds. In the opening bout southpaw Crain is outworking Kasprzak who halfway through started to go to the body since he couldn’t hit him in the head. Crain went to body and head with leading lefts to the chin. In the second round both mixed it up well with Crain landing the best punch a short left to the chin of Kasprzak. Crain continues to land more than Kasprzak. In the third round Crain landed a left uppercut to the chin hurting Kasprzak. Near the end of the round Kasprzak’s head cleared and both boxers ended the round slugging it out. In the fourth and final round a wide left hook from Kasprzak dropped Crain for referee Clark’s mandatory 8 count. Crain came back and Kasprzak looked spent. Judge Page had it 38-37 Kasprzak. Both judges Poturaj and Rubenstein had it 38-37 for Crain as did this writer. Ring Announcer was Mark Fratto. There were not any “fighters of the night” in this one in which looked like another full house for Hard Hitting Promotions. They will be coming back the end of March with a site to be determined. It’s February 27th, 2016. It’s the 5th round at Madison Square Garden. After some early success in the fight, Hank Lundy is up against the ropes as Terrence Crawford tees off. The referee decides he has seen enough and jumps in. The fight is over. “That fight was stopped too early” says an incensed Hank Lundy, “I was still throwing back. They knew how dangerous I was and the ref stopped it as soon as he could”. Speaking a year and a half on from that fight, the loss clearly still cuts deep for the man from Philadelphia. His mean competitive streak burns at him for another shot at a world title. Following the Crawford fight, Lundy has had a couple of comeback fights. He made relatively light work of both John Delperdang and Daniel Evangelista Jr to take two comfortable wins. But now he is back and ready for another shot at the big time, “Hammerin Hank is back and better than ever” he says. It was in an encounter with the high school bully that left the bully asleep on the ground, that Hank first realized that he could fight. His uncle also quickly realized the potential that a young Lundy harbored and immediately got him into the boxing gym. Lundy sacrificed a partial college football scholarship so his family could afford to send his sister to college. “I told them I’d find another way” says Lundy, and boxing proved to be exactly that. He had a promising amateur career, finishing runner up at the 2005 national Golden Gloves and then another runner up spot at the Pan-Am championships. In 2006, Lundy turned pro signing with Jimmy Burchfield and Classic Entertainment sports. Fighting primarily out of New England, Lundy stormed through his early fights which allowed him to carve out a strong reputation. His brave and aggressive fighting style made him exciting to watch and it wasn’t long before the big time came calling. Lundy’s first big test came against the feared Viktor Postol. “When my promoter comes to me and asks if I want a hard fight or an easier option, I take the hard one every time” says Lundy. Lundy flew over to Postol’s native country of Ukraine and took him all 12 rounds, losing a decision on enemy turf. This set him up for his world title shot against Terrence Crawford. A loss that hit him hard, but by no means broke the man from South Philly for who sadly, adversity is nothing new. His thoughts now turn to another world title shot. True to his fearless nature, Lundy doesn’t care who he fights, he just wants a world title. Lundy has a keen eye on the upcoming clash between Adrien Broner and Mikey Garcia. Lundy was called in to spar by both camps but he refused, “they just want to get a better look at me” he says, “They know I’d beat both of them, everyone is running scared of me”. Hammerin Hank Lundy did it the hard way, rising from the streets of South Philly to the top flight of boxing. Nobody ever gave him anything, he had to go out and get it, and that’s why he is so dangerous in the ring. Lundy is back fighting at 135lb and he is better than ever. If not Garcia or Broner then he wants either Terry Flanagan or Robert Easter Jr. He says he will beat all of them but the boxing public will just have to wait and see.